Christianson Air Conditioning & Plumbing is committed to providing systems of the highest quality and reliability. After extensive quality testing, Christianson sells and installs Noritz and Rinnai tankless water heaters. When is the last time you relaxed and soaked yourself in a hot steamy bath? Unfortunately, a tank water heater can only supply enough hot water to fill a bath tub and may have enough hot water left for a quick shower. With a Noritz tankless water heater you will get endless hot water. Tankless water heaters heat water on demand, and that means you never have to worry about running out of hot water. Imagine the luxury of always having enough hot water for everyone to enjoy and relax – hot tubs, showers and still have an endless supply for the rest of your household needs. Not only can a tankless water heater provide an endless supply of hot water, it can also deliver more of it for all your hot water demands. For environments with high hot water demands, only Noritz offers a multi-system setup that can link 2 to 24 units, which translates to 317 gallons per minute – enough for over 126 showers at once! With this much volume, Noritz tankless water heaters can meet any hot water demand of today’s homes or businesses. Compared to traditional water heaters, one of the most obvious differences is its small size. Compact in design, Noritz tankless water heaters can be installed virtually anywhere, mounted on the wall, inside or outside. Depending upon your needs are, you can actually relocate the tankless heater closer to the fixtures you use most often for fast hot water delivery. Therefore, a tankless not only saves you space, but can also save you water. With a Noritz tankless water heater, you’ll save energy and thus, money. Our on-demand systems require no pilot light and can save about half the cost of your current water heating bill since there is no re-heating of water as with traditional water heaters. A tank-style water heater has 60% efficiency, but a Noritz tankless water heater has an 83%-94% energy-efficiency levels making it much more eco-friendly. Noritz tankless water heaters are extremely durable, lasting longer than traditional tank-type water heaters and requiring little maintenance over its lifetime. If for some reason it needs to be serviced, any single part of the heater can be replaced and fixed. Noritz tankless water heaters are backed with one of the best warranties in the industry. Rinnai tankless water heaters heat the water you need, when you need it, turning any water source into hot water on demand. Whether you are washing the dishes, washing your clothes, taking a shower or drawing a hot bath, Rinnai’s tankless water heater technology will supply endless hot water to your lifestyle demands-even if it demands you do them all at once. 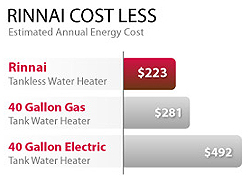 Reduced Energy Costs – With Rinnai tankless water heaters, you will enjoy up to 40% energy savings. That’s because Rinnai units are designed to be highly efficient and only heat water when it is needed. When the demand for hot water ceases, the unit shuts down – a revolutionary advantage over inefficient tank-style heaters. Longevity – Rinnai tankless water heaters have a typical life of up to 20 years, when installed in residential applications. This can be twice as long as a tank style unit. Clean, Fresh Water – Traditional tank-style water heaters can build up rust and scale inside their tank, where the hot water you use for bathing and drinking is stored. With Rinnai tankless water heaters you will always experience fresh, clean water that is heated on demand, as it passes through the unit. Space Savings – Traditional tank water heaters can take up to 16 square feet of valuable floor space. However, Rinnai tankless water heaters are about the size of a carry-on suitcase and can be installed on virtually any wall inside or outside of your home. Greater Capacity – Meeting increased hot water demands can be a challenge for traditional tank-style heaters, however, with Rinnai’s innovative technology you’ll never run out of hot water. Peace of Mind – With Rinnai tankless water heaters, there’s no tank to leak or break.